When it comes to designing new staircases for our customers, the team at Jarrods like to stretch their creative legs. A perfect example is a helical staircase design that puts an interesting twist (pun intended) on our “floating box” Kubos range. It’s proved a popular range, you can see an example in our Baker family customer story. Our technical designer, Ben, took the basic concept of the Kubos staircase and put his own spin on it (last pun, we promise). Here’s Ben to explain more. My role at Jarrods is to use both the customer’s staircase specification from their first meeting and the measurements gathered from the survey, to design a thoroughly bespoke staircase. It needs to make the best use of available space but without sacrificing the aesthetic that the customer wants to achieve. I create technical drawings and liaise with manufacturers to ensure that the completed staircase is of the highest quality. From time to time, to keep us at the forefront of staircase design, it’s nice to step back and work on some new, innovative concepts. Which brings us to the Helical Kubos. We have been perfecting our Kubos design for some time now, taking it to levels that we would never have thought achievable. Having applied the design to so many different styles of staircases, there was still one that we hadn’t touched on yet. The helical staircase. Helical comes from the word helix, best illustrated by the instantly recognisable double helix of a DNA strand. Unlike a spiral staircase, a helical staircase design doesn’t have a central column. Instead, just like a DNA strand, they consist of two rolled stringers, with the treads attached between them. This proved to be the building blocks for a new evolution of the Kubos range. Our most recent development in the Kubos design has allowed us to create a staircase that doesn’t require being attached to a wall. This sparked the idea to marry a helical design with Kubos’ “floating boxes”. 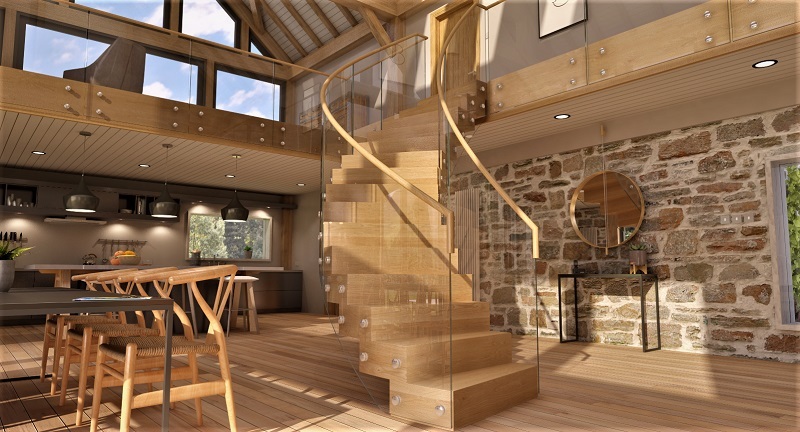 What we’ve created is quite unique; a wooden and contemporary glass staircase design that, we believe, hasn’t been seen on the staircase market. The sweeping curves of the balustrade are in stark contrast with the cubic treads, putting emphasis on the two opposing forms and creating a striking first impression. We’ve been inspired by helical staircases for a long time. Due to their complex nature, they are arguably the pinnacle of staircase design. We now have a chance to put our own stamp on this beautiful style of staircase. We’re certainly excited about the possibilities that the Helical Kubos will bring to our future staircase renovation projects. If you’d like to find out more, give us a call today.